It took me a moment to register my name and another to recognize Luke’s face. The last time I talked to him was over a year ago when we sat in a bar going over everything I could tell him about the Pacific Crest Trail. He went southbound last summer, starting at the Canadian Border in snow so deep that he earned the nickname “Crazy Mother” because those were the first two out of three words someone used to describe him. An hour either way and we would have missed each other. I would have floated away or he would have walked down a trail to the other end of the island, but instead, he stood in the Windigo store as shocked as I was to run into someone he knew on Isle Royale in the middle of Lake Superior. He’d hiked in from Rock Harbor, about fifty miles away on the other end of the island, and was headed back to catch a ferry in a few days. I recognized that need to move in his eyes, the one all thru-hikers have after a trip ends, the longing for a trail that stretches far, far beyond the horizon, something a hundred miles on Isle Royale wouldn’t quiet because that longing never goes away. He told me he was thinking about adding a ten-mile loop to this end of the hike before he headed back to Rock Harbor. I just smiled and told him he should go for it, knowing that he would because his legs needed the miles and I knew I would have done the same thing. He smiled back then convinced me to walk it with him. 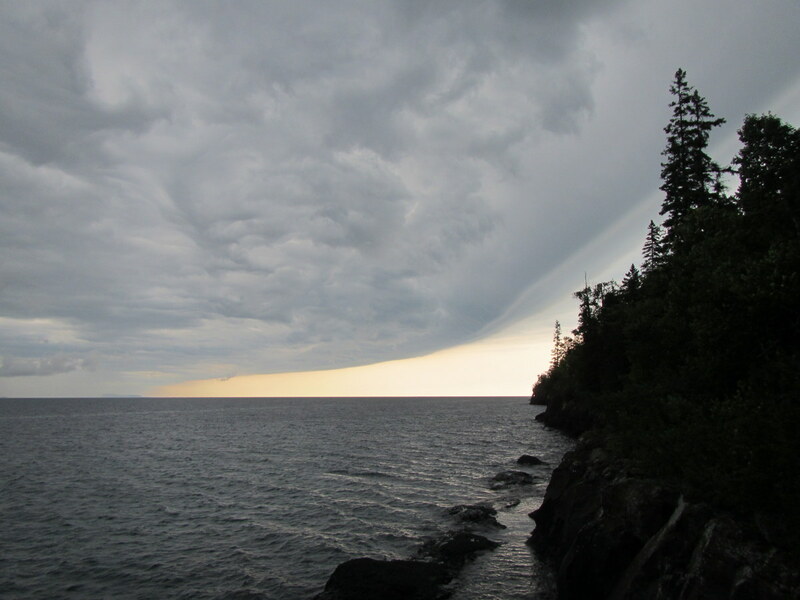 That’s how I ended up on the north shore of Isle Royale watching a line of storm clouds race across the lake when I could have been on the south side, thinking the day was perfect and clear. The storm would have popped over the island’s ridgeline, angry and alive with thunder, and been on top of me before I could make it to shore. Instead, I walked through the forest eating thimbleberries and laughing about luck while rain poured around us. That’s the thing about luck though, sometimes it’s a Crazy Mother. Posted in Angle to Key WestTagged AKW August, Angle to Key West, hiking, isle royale, lake superior, luck, nicknames, storms, thru-hikers, trail names, windigoBookmark the permalink. By the headline, I thought it was about your mother, Anna. But I still enjoyed the post and it reminded me of the magic that can occur on a trail. I was on a 3 day hike in the Adirondacks and met the only other hiker on the opposite end of a dangerous log stream crossing, so we spotted each other before continuing on our journeys.